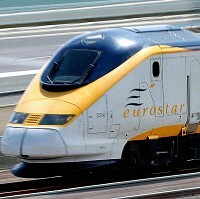 Eurostar are on track for a bumper Easter and royal wedding weekend following a big surge in bookings. The Channel Tunnel high-speed train company said it will be transporting 8% more passengers from the UK to Europe this Easter than it did in 2010. Eurostar is also enjoying increased inbound sales ahead of the royal wedding. Commercial director Nick Mercer said: "We're expecting this to be our busiest Easter weekend for years. At the same time we're equally seeing a surge in bookings to London for the royal wedding weekend." Travel website lowcostholidays.com said Easter weekend bookings were 70% up on the same weekend last year. Britons taking out travel insurance for Easter getaways are favouring the Spanish island of Majorca, which is proving the top destination for Britons, with the Canary Islands, the Portuguese Algarve and Egypt also popular. Lowcostholidays.com product director Matt Hall said: "Many holidaymakers are planning to watch the royal wedding from their holiday while others are hoping to escape from the wedding fever."